Watch Kendrick Lamar Rank His Own Albums And Reveal The Original Title Of DAMN. The Compton rapper also addressed the companion album conspiracy theories in a recent interview on Big Boy TV. Kendrick Lamar recently stopped by Los Angeles's Big Boy TV to discuss his DAMN. album, touring, and more. During the interview, the Compton native revealed that his recent full-length project originally had a much longer title. Kendrick originally called the album What Happens On Earth Stays On Earth, a phrase repeated by Kid Capri on the project. Elsewhere in the interview, Kendrick shared a ranking of his own catalog, and the order might surprise some fans. He placed his debut, Section.80 at number four, followed by To Pimp A Butterfly, good kid, m.A.A.d city, and DAMN. at the top spot. 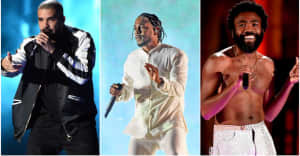 Kendrick also spoke about the conspiracy theories that surrounded the release of DAMN., namely the idea that he had made a second album to release as a companion piece. “I had a... a selection of songs. I don’t wanna call it an album, but it definitely made sense for DAMN.," he said. Watch Kendrick Lamar's interview with Big Boy TV above. Read The FADER's review of Kendrick Lamar's DAMN. album.